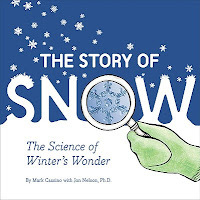 The Story of Snow: The Science of Winter's Wonder by Mark Cassino with Jon Nelson, Ph.D. (Grades 1-5.) Chronicle Books, October 2009. Copy provided by my local library. For the past several winters, I lived in northern Illinois. Where we, y'know, actually got snow. Now I'm back in Kentucky where we occasionally get snow, but not very often. I'm jonesing. So, I turned to The Story of Snow: The Science of Winter's Wonder and I found it to be beautiful and interesting. You'll want to pick this up for your units and programs on winter and snow, most definitely. Snow falls from the sky and it covers the ground. And it's cold and it's made up of snowflakes, which are made up of snow crystals. But how exactly does it happen? And what does a snow crystal actually look like? The Story of Snow answers both these questions. There is information about how snow crystals are formed and why they make the shapes they do. The real strength of the book, though, is the gorgeous snowtography (er... the pretty, pretty photos of snow crystals). Mark Cassino is a nature photographer by trade and he displays beautiful images in the pages of this book. Kids and adults alike will be fascinated by the up-close photographs and inspired to take a closer look at the snow falling this winter. The authors even include step-by-step instructions for how to get a good look at snow crystals yourself. Pair The Story of Snow with Snowflake Bentley by Jacqueline Briggs Martin and make a date to study the crystals the next time it snows. Check out more of Mark's fascinating photography on the book's blog: www.storyofsnow.com, look at a preview of The Story of Snow on Scribd, and read Amanda's review at A Patchwork of Books. Happy Nonfiction Monday! Head on over to Simply Science for the roundup! This looks like a great book, and I look forward to seeing it.